Another week, another easy platinum from Ratalaika Games. Two in fact as they continue to support the Vita with new cross-buy title Daggerhood. 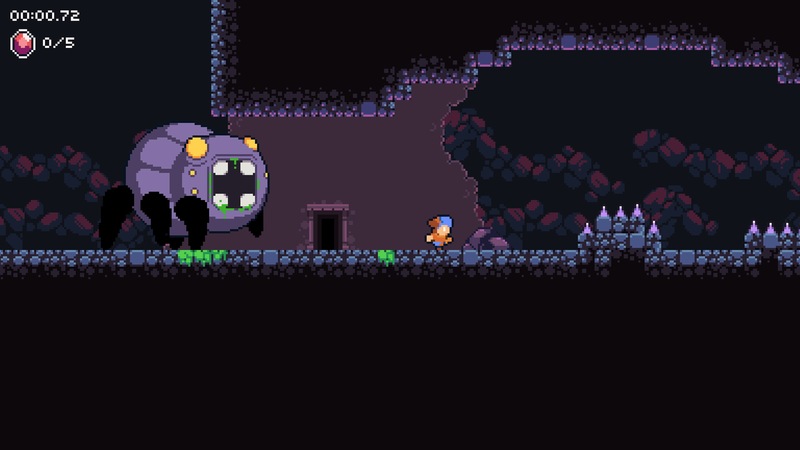 The genre this time is tough platformer, though it does have an interesting gimmick at the centre of it all. You play as Vincent D. Daggerhood, a thief who has been caught and cast into a pit for his crimes. He vows to escape and steal the king’s treasure to boot. It’s easy to see how he was such a successful criminal as he has a unique ability. 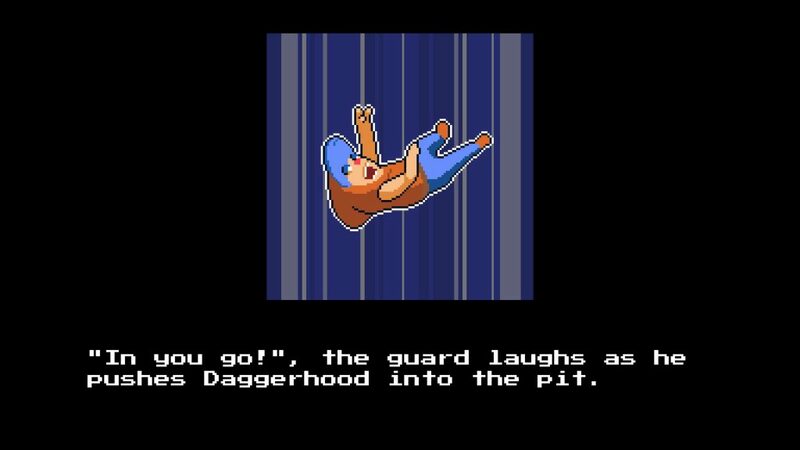 As well as running, jumping, double jumping and wall jumping Daggerhood can throw a dagger. This can be used as a weapon on the few enemies that wander the levels but, more importantly, he can teleport to the dagger’s current location. There is a limited range on it so at a certain point it just vanishes and you can throw it again but press the attack button a second time at any point whilst the dagger is out and Daggerhood will appear in that position. The most basic use of this skill will involve throwing your dagger between a set of spikes which are too close together to jump between or over a pit that’s too far to jump across. 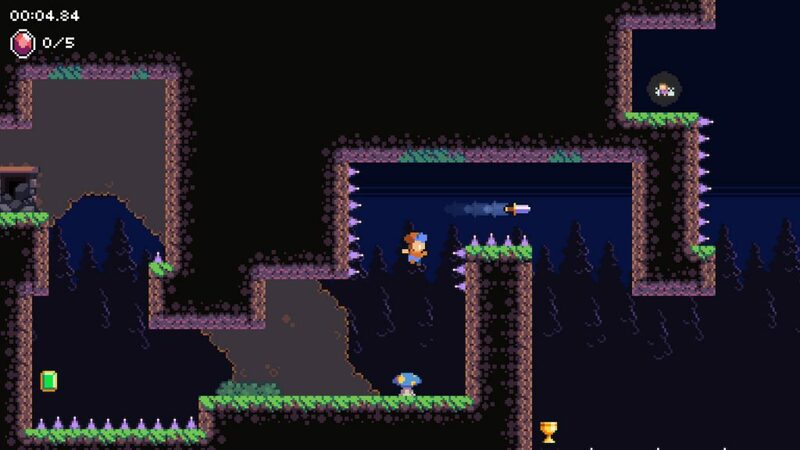 Later levels introduce more complex set ups and the potential for speed running, by using your dagger to move forward rather than running, is high. Which is useful as completing the rather short levels isn’t the only goal. Being a thief you want to collect all the treasure (five items) on a level, but there’s also a fairy which will disappear after a certain amount of time incentivising speed and you get a star rating out of three at the end of the stage, again based on time. You don’t have to do all three goals at once luckily, but they are necessary for the trophies. Yet again you only have to complete a portion of the game in order to get the platinum, which won’t take you long at all, possibly half an hour. There’s a trophy for completing twelve levels, and trophies for completing ten levels with three star rating, collecting all treasures and collecting the fairy. Pretty simple stuff. There are five worlds, each made of twenty levels (the final level in a world being a boss fight) so you’ll not even have completed the first world by the time your trophy whoring is complete. Which is a shame as Daggerhood is a well put together game with pleasant, consistent, retro inspired visuals but repetitive music. 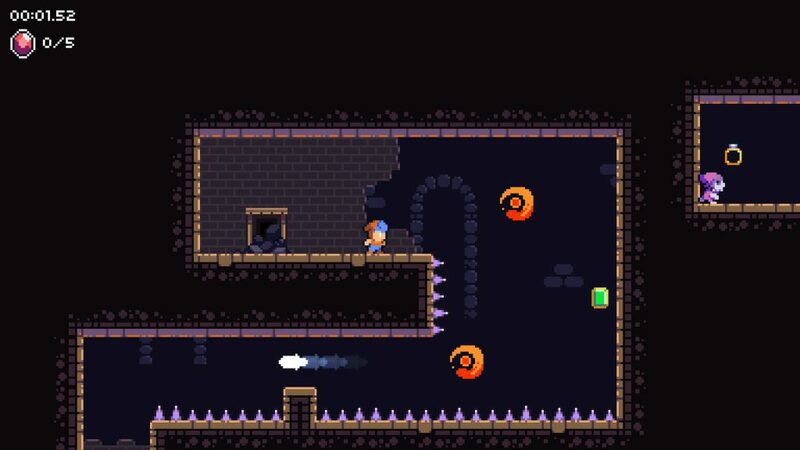 It is quite tough, one hit restarting the level, and the use of the knife on top of jumping around takes some getting used to but new elements are introduced as you progress as you’d expect of a quality platformer including new traps and time limited power ups which grant you the ability to break blocks or gently float downwards. The bosses aren’t anything to write home about and the hit box on the spikes caught me out constantly but it’s a challenging title that will keep fans of the genre entertained for a few hours. Daggerhood is not the best example of the tough platforming genre, the mechanics aren’t quite as tight as the Meat Boys and Speedrunners of the world but it’s also priced incredibly fairly. Sadly most people will see the first twelve levels and be done with it but if you do persist beyond that then you’ve got a well made, but challenging, platformer here with a decent amount of content beyond a couple of easy platinums.